I am a Southern Baptist who has a lot of respect for the Catholic faith. The Immaculate Conception is a hard concept for me. Does it also include the belief that Mary never sinned? How does that pass muster with Rom. 3:23 “For all have sinned and come short of the glory of God?” It seems like Paul would have noted the one exception here in Mary if that were the case. From my limited studies, I think Catholics have a very good argument for their position regarding the Eucharist. But wasn’t it several centuries before this concept of Mary arose in the Church? Dear Friend: yours is a good question. From the early centuries, Mary was considered the All Holy One and considered as without sin. Rom 3:23 is a general statement but does not mention exceptions to the rule. For example, Jesus was a man without sin, therefore an exception. 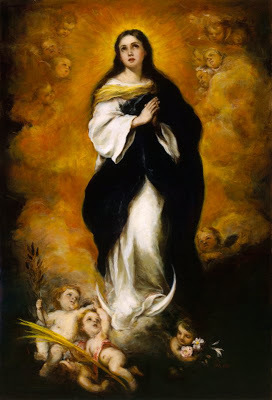 You will find helpful writings on this matter here, especially the short explanation on the radio of the Immaculate Conception and Assumption. Another thing that’s overlooked is that Rom 3:23, although it alludes to Psalm 14:2–3, this “prooftext” needs to be read in context, namely the preceeding verse Psalm 14:1 which states that the “all” refers to the fool who says there is no God. Given that Jews believed in God, the only plausible way Rom 3:23 could refer to Psalm 14:2–3 is in the practical sense, namely both Jew and Gentile live their lives as if there were no God and thus fall into sin. One only needs to skim the Old Testament or read the news today to see plenty of examples of this (Psalm 94:7-8). Wow Steve! Nailed it again!!! I’ll offer prayers for your Baptist friend (and hopefully soon-to-be Catholic) as he examines his faith!!!! (i) What about Psalm 51:4-5 and Luke 2:21-22? STEVE RAY HERE: Have you read in Genesis 3 that it was not pain that would accompany the woman now that sin entered but that her pain would be greatly increased. I agree the woman of Rev 12 is symbolic, but primarily it is Mary which is obvious. David acknowledges that he sinned against God. He also acknowledges that he was born in the original sin which we all inherit from our parents. Although He never sinned, He submitted to Baptism for the remission of sins. To fulfill all righteousness. That is the same reason why, the sinless Virgin Mary, submitted to the purification ritual, to fulfill all righteousness. The Woman of Rev 12 is definitely Mary. STEVE RAY HERE: Have you read in Genesis 3 that it was not pain that would accompany the woman now that sin entered but that her pain would be greatly increased. So “pain” would be the result of sin Eve and generations of women after her would have to experience in child birth. If Mary is conceived without the stain of original sin, then she would not experience pain at child birth. The Scripture in Revelation 12:1-2 says the women was in pain as she travailed in child birth. Thus the women is only symbolic. The Woman of Rev 12 is described as the Mother of the Messiah. Therefore, she symbolized Mary, the Mother of Jesus Christ. Adam and Eve were created without sin and existed in that state until the fall happened . So Rom 3:23 cannot be applied to everyone because there are exceptions to the rule . In most of Chapters 12-14 of Revelation, John makes a restatement of the second half of the 70th Week (just as he did in Chapter 11). Initially, however, two “signs” are seen—a “woman” and an “enormous red dragon”—indicating that they are not literal but, rather, are symbolic of other things, which were present in the world long ago. A “woman clothed with the sun, with the moon under her feet and a crown of twelve stars on her head” is seen (Revelation 12:1). According to Genesis 37:9,10, these represented the first family of Israel: Jacob (the “sun”), Rachel (the “moon”), and Jacob’s twelve sons (the “twelve stars”). Israel was the “embodiment” the Torah or Law, which is God’s eternal commandments, rules, and guidelines. John noted that the woman “gave birth to a son, a male child, who will rule all the nations with an iron scepter” (Revelation 12:5). Loosely speaking, this “son” could represent Judah, since Jacob (also named “Israel”) prophesied that his son Judah would be associated with the “scepter”—a symbol of governance, rule, and law (Genesis 49:10). More specifically, the son of the woman—and the Son of God—who came into the world was Jesus Christ (1 John 4:14,15). He is the descendant of Judah who will rule the nations “with an iron scepter” when He comes (Revelation 19:15). In a sense, this “woman” is the earthly city of Jerusalem, since the Israelites were the embodiment of the woman, and their primary dwelling place was Jerusalem. Jerusalem was considered to be the “wife” or “bride” of God (Jeremiah 2:2); however, she was an “adulterous wife” (Ezekiel 16:32). Therefore, the New Jerusalem, the capital city of the new heaven, will become the perfect “Bride” of the Lamb of God when it comes out of the new heaven (just as Eve came out of Adam)—after a new heavens and a new earth have been created (Revelation 21:1,2,9,10) by God (see old and new Creations). Within the New Jerusalem will dwell “those whose names are written in the Lamb’s book of life” (21:27). Incidentally, this “woman” is not symbolic of Christianity or the Church, a view which is embraced by some Christians. The Church did not “replace” Israel. At a future time, Israel (Zion) will receive all of the blessings promised to her millennia ago by God (Isaiah 45:17, 51:2,3,16; Jeremiah 50:4,5; Ezekiel 36:1–37:28). Also, the “woman” does not represent only Jews, who are descendants of Judah, since they are only one of the twelve tribes of Israel. “There are exceptions”=”This means you too are an exception”? I’m not following the logic. No, the pain would not be the result of the sin of Eve; the INCREASE in the pain of childbirth would be the result of the sin of Eve. Had Eve not sinned, there still would have been pain in childbirth, just less of it. You cannot increase something that does not exist. So the prophetess Anna, of the tribe of Asher, was not a Jew? So, St. Paul, of the tribe of Benjamin was not a Jew? So, St. John the Baptist, of the tribe of Levi was not a Jew? STEVE RAY HERE: Theoretically and genetically neither Anna nor Paul were “Jews.” “Jew” comes from Judah which was only one of the twelve tribes of Israel. Anna was from the tribe of Asher and Paul from the tribe of Benjamin, thus not “Jews.” And no, Levi was also distinct from Judah. Hebrews, yes. Israelites, yes. Jews, in common parlance yes, but strictly by tribal association, no. You’ve forgotten Rev 11:19. It is the last sentence in Rev 11 and comes right before Rev 12:1. Now, remember, when the New Testament was written, there were no chapter divisions. These verses would follow one after the other with no disconnect. There can be no doubt, that the Ark which is seen in heaven is the Ark of the New Covenant. Mary. What does Mary have in common with the Ark? The Ark contained the Manna, the Bread of Heaven. Mary contained in her womb, the Bread of Heaven, Jesus Christ (John 6:51). The Ark contained the Rod of Aaron, the High Priest. Mary contained in her womb, the True High Priest, Jesus Christ (Heb 3:1). The Ark contained the Ten Commandments, the word of God. Mary contained in her womb, the Word of God, Jesus Christ (John 1:1). St. John said he saw the Ark of the Covenant in heaven and then described, not a box of wood, but a Woman being crowned with twelve stars. A Woman who gave birth to the Messiah. The only one whom St. John could be describing is Mary, the Mother of Jesus Christ. What do you believe about Grace? Is it God’s Divine Life given to us? Is it what cleanses us from sin? The vast majority of Christians would agree with that – I know there are new types and beliefs popping up daily so I won’t presume you do. The translation, tense and conotations are profound. If ya can’t refute ’em, call ’em names. If ya can’t refute ‘em, call ‘em names. My sniffer is functioning properly. We have trollers galore. Can you start a refuting institute? We’re off to a pretty good start. We refuted your objections. Here you go. This is Tim Staples speaking on this subject. Great post, Steve. Indeed, St. Paul’s point in Romans 3:23 is that there are no perfect ETHNIC or RELIGIOUS GROUPS of people. Quite possibly there have been multitudes of immaculately created people throughout history, and it’s not up to us to say unequivocally how many or how few. We can glean an idea of such things from the Scriptures, though. I’m currently possessed of the belief that Enoch and Elijah lived without sin during their lives, and that is why they were blessed with the privilege of being assumed in body into Heaven. Otherwise, they would need to shed their sin-infected skin and flesh by dying in this world like all other created people in the Bible except the Blessed Virgin. Nothing unclean can enter Heaven. What say you? If “All have sinned” then Jesus too must have. No. Jesus and Mother Mary were exceptions. Thank you for asking properly.. God bless you. It's always a mistake to infer things that are not in the bible as Christian truths. STEVE RAY HERE: Oh, really! And you are the final judge of what Scripture says and doesn’t say? I would like to do a Bible study with you (if I had the time) and show you quite clearly from the Old and New Testaments a lot about Mary that you seem blind to because you seem to think you know everything there is to know about scripture. You’d be wise to go back and read what the the pastors and Bible teachers of the first five centuries had to say. Thank you Steve for your friendly comment.myounseem to get very defensive about certain aspect of Catholic teaching. You mention the early church fathers and pastors but make no mention of what the bible says. Tradition is fine but not at the expense of truth. I think you will find it amazing since Protestants have not understood this. Of course when I was a Fundamentalist Protestant my Baptist tradition blinded me from seeing it. Not being contentious, just curious. I honestly don’t understand all the fuss and focus around the belief or disbelief in an immaculate conception of Mary. I really don’t see where it affects a person‘s ability to spend eternity with God …or not. Point ofcontention: Does the word contains the concept of past present and future. Point of contention: Does the word all actually include all. “And so it’s [the Immaculate Conception] something that is consistent with and coheres with the use of the word kecharitomene there, but it’s not something that the word kecharitomene requires. This is a Greek term that you could use in that exact grammatical formation for someone else who wasn’t immaculately conceived” (James Akin, Catholic Answers Live, audio file downloaded from http://www.aomin.org/aoblog/index.php?itemid=4617). And again, why the donneybrook? Jesus is still Lord. Mary is still his mother. STEVE RAY HERE: Please understand I don’t have the time to to debate such things as I once did. Even bow on a pane which is taking off ? You may not have realized it yet but Mary is the Ark of the New Covenant (https://www.catholicconvert.com/blog/2016/05/31/mary-ark-of-the-new-covenant-2/) and one in the Old Covenant might ask “Why is the Ark of the Covenant so important and pure and untouchable? Mary is not just a conduit. She is the Mother of a Divine Person — the Mother of God. Interesting folks like you believe in Bible Alone and the Rapture, etc. yet there is not ONE VERSE in the Bible that teaches that Protestant tradition. Yet you expect me to …. Plane taking off. Good bye…. DOES “ALL” MEAN “every single person”? By saying “All”, Paul is merely making the point that all races of mankind. Both Jews and Gentiles alike. Paul is not discussing individual cases. 1 Cor. 15:22 – in Adam all (“pantes”) have died, and in Christ all (“pantes”) shall live. That demonstrates that “all” does not mean “every single person” because know all have not died. We know Enoch and Elijah were taken up to heaven, and NOT all will go to heaven just because Jesus said “all”. Rom. 5:12 – Paul says that death spread to all (“pantes”) men. Again, this also proves that “all” does not mean “every single person” because death did not spread to all men as we have seen with Enoch and Elijah. Rom. 5:19 – here Paul says “many (not all) were made sinners.” Paul uses “polloi,” not “pantes.” Paul is not contradicting what he said in Rom. 3:23. Paul is merely conveying that all are “subject” to original sin, but not all reject God. Romans 3:23 is only part of a sentence. If you really believe that “ALL” means “ALL” in Romans 3:23, and as scripture shows that Romans 3:23 is only part of the sentence, then you have to believe that ALL are also justified (hence saved) as stated in the rest of the sentence (Romans 3:24). Hence you have to say that you believe in universal salvation?? If we take scripture as a whole and let scripture interpret scripture, as you say, then if you say that ALL have sinned then ALL are also justified as the word ALL refers to both. Converse is also true. If not all are justified, as you say, then not all have sinned. So how can you say that ALL means ALL only in the first part of the sentence (Romans 3:23) and not the second (Romans 3:24), which you no doubt do?? We all have an obligation to study the Scriptures, do we not, so If I may ask, please find others verses written by the same author, to confirm this very odd type of Greek grammatical construct in which a word used in a sentence has different meanings at first part compared to the second part of a sentence, although referring to both grammatically. If the author of Romans 3:24 had meant that not all are justified (saved) than I am sure that the Holy Spirit would have inspired him to chose the appropriate Greek word as used in other verses such as “…..many are called, but few are chosen”. Surely such an important concept expressed in the sentence Romans 3:23-24 would not have been left ambiguous by the author to such an extent that you have to split it and have the word “ALL” refer to only the first part. Why I am not allowing your Comment on my blog. It is a bunch of the same old stuff that I used to use against Catholics until I realized how uninformed my arguments (and yours) were. So, if ALL means ALL in Scripture, then you agree that every single person in Judea and Jerusalem went down the 25 miles to the Jordan River? Not one person stayed back in Jerusalem? Every single one of them were baptized? Come on! If you are one of those who says “Scripture interprets Scripture” then take you own advice. Also on this first point do you realize Paul is discussing Jews and Gentiles? Jews thought they were without sin because they were the chosen people — Gentiles were the sinners. Paul is saying all have sinned — Gentile AND JEW! All…. Compare this with Psalms 14 and 53 from which Paul quotes this passage (along with Romans 3:9-18) about “all have sinned.” If you notice that after he says this he refers to “his people” who are obviously not included in the “all have sinned.’ Do you think Paul will quote the OT out of context. You do, but he does not. One last point, though I could keep going. If ALL sinned does that include Jesus? He was born a man and would of necessity be included in the ALL. What about the baby or mentally retarded? Are you going to condemn them to hell among the ALL? You really need to set aside the same old, same old Fundamentalist nonsense and read the Bible in it’s historical, literal and contextual context. I did and became Catholic like thousands and thousands of other Protestants who are discovering the truth. Actually, I am going to post your comment with my above response. God bless. Unfortunately I am a bit confused with your response and I hope you can clear up my confusion. You say: Let’s just take the first paragraph. You say ALL means all….. In my experience, protestants only apply “ALL” to Romans 3:23 when the word “ALL” should also be applied to Romans3:24 as it is a continuation of Romans 3:23 sentence wise. Hence if “ALL” means ALL in Romans 3:23, the protestant would have to say that “ALL” are also justified (Romans 3:24) which they do not, unless they believe that Paul is teaching universal salvation. I am aware of the points/examples you raised and do use your site for information, but cannot see how my pointing out that protestants, in order to make their point, have to resort in splitting a sentence into two and apply the word “ALL” only to the first part and not the second, makes for a valid argument on their part. I am of Catholic faith, Not a protestant. My apologies if I did not indicate this at the beginning. Much appreciated if you could mention were this idea about splitting scripture sentences into two and only using the first part to support a belief has been used ?? Previous post: Two Masses Over Christmas: Sunday and Monday. One Priest dispensed his people from Sunday Mass. Can he do that?